Using the Post Meta Generator feature makes it easy to create a post meta box to override Headline and Description for the schema.org markup output. 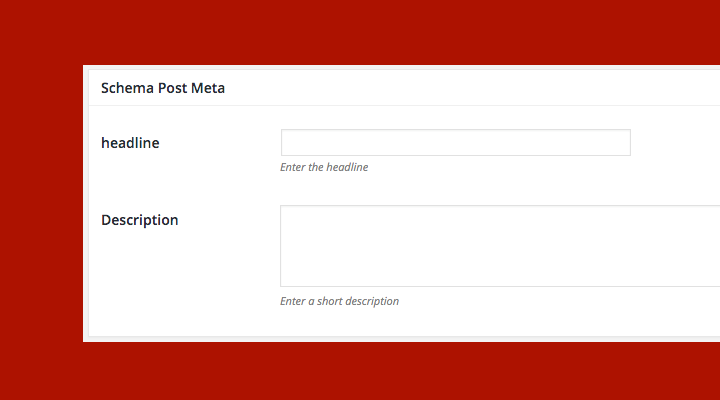 In this example, we will see how to configure the Post Meta Generator by creating two fields, one for Headline field and the other for Description field. Note that new_headline and new_description is the post meta keys, you can change it to your liking. If you’ve configured the Post Meta Generator in the example above, the Schema plugin will show a new post meta box in Editor page to allow you to set the new values for Headline and Description. Note: You can apply the same thing for Author Name.